This article is about England and Wales. For high court, see High Court. For other uses, see High Court of Justice (disambiguation). The High Court of Justice was established in 1875 by the Supreme Court of Judicature Act 1873. The Act merged eight existing English courts—the Court of Chancery, the Court of Queen's Bench, the Court of Common Pleas, the Court of Exchequer, the High Court of Admiralty, the Court of Probate, the Court for Divorce and Matrimonial Causes, and the London Court of Bankruptcy—into a new Supreme Court of Judicature (now known as the Senior Courts of England and Wales). The new Supreme Court was divided into the Court of Appeal, which exercised appellate jurisdiction, and the High Court, which exercised original jurisdiction. Originally, the High Court consisted of five Divisions—the King’s Bench, Common Pleas, Exchequer, Chancery, and Probate, Divorce and Admiralty divisions. In 1880, the Common Pleas and Exchequer divisions were abolished, leaving three divisions. The Probate, Divorce and Admiralty Division was renamed to the Family Division by the Administration of Justice Act 1970, and its jurisdiction reorganised accordingly. The High Court is organised into three divisions: the Queen's Bench Division, the Chancery Division, and the Family Division. A list of hearings in the High Court's divisions is published daily. The Queen's Bench Division – or King's Bench Division when the monarch is male – has two roles. It hears a wide range of common law cases and also has special responsibility as a supervisory court. Until 2005, the head of the QBD was the Lord Chief Justice. The post of President of the Queen's Bench Division was created by the Constitutional Reform Act 2005, leaving the Lord Chief Justice as President of the Courts of England and Wales, Head of the Judiciary of England and Wales and Head of Criminal Justice. Sir Igor Judge was the first person to hold this office, appointed in October 2005. The Queen's Bench Division has supervisory jurisdiction over inferior courts, and its Administrative Court is generally the appropriate legal forum where the validity (but, at least in principle, not the merits) of official decisions may be challenged. Generally, unless specific appeal processes are provided, the validity of any decision of a government minister, inferior court, tribunal, local authority or official body may be challenged by someone with sufficient interest by judicial review in the Administrative Court of the Queen's Bench Division. A single judge first decides whether the matter is fit to bring to the court (to filter out frivolous or unarguable cases) and if so the matter is allowed to go forward to a full judicial review hearing with one or more judges. In addition, the Queen's Bench Divisional Court hears appeals on points of law from the Magistrates' Court and from the Crown Court. These are known as appeals by way of case stated, since the questions of law are considered solely on the basis of the facts found and stated by the authority under review. Other specialised courts of the Queen's Bench Division include the Technology and Construction Court, Commercial Court, and the Admiralty Court. The specialised judges and procedures of these courts are tailored to their type of business, but they are not essentially different from any other court of the QBD. 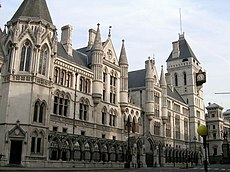 Appeals from the High Court in civil matters are made to the Court of Appeal (Civil Division); in criminal matters appeal from the Divisional Court is made only to the Supreme Court of the United Kingdom. The Chancery Division (housed in the Rolls Building) deals with business law, trusts law, probate law, insolvency, and land law in relation to issues of equity. It has specialist courts (the Patents Court and the Companies Court) which deal with patents and registered designs and company law matters respectively. All tax appeals are assigned to the Chancery Division. The head of the Chancery Division was known as the Vice-Chancellor until October 2005, when the title was changed by the Constitutional Reform Act 2005 to Chancellor of the High Court. The first Chancellor (and the last Vice-Chancellor) was Sir Andrew Morritt, who retired in 2013 to be succeeded by Sir Terence Etherton. In 2016, Sir Geoffrey Vos succeeded Sir Terence as Chancellor on the latter's appointment as Master of the Rolls. Cases heard before the Chancery Division are reported in the Chancery Division law reports. In practice, there is some overlap of jurisdiction with the QBD. From October 2015, the Chancery Division and the Commercial Court (England and Wales) have maintained the Financial List for cases which would benefit from being heard by judges with suitable expertise and experience in the financial markets or which raise issues of general importance to the financial markets. The procedure was introduced to enable fast, efficient and high quality dispute resolution of claims related to the financial markets. The formation within the High Court of The Business and Property Courts of England & Wales was announced in March 2017, and launched in London in July 2017. The courts would in future administer the specialist jurisdictions previously administered in the Queen's Bench Division under the names of the Admiralty Court, the Commercial Court, and the Technology and Construction Court, and in the Chancery Division under the lists for Business, Company and Insolvency, Competition, Financial, Intellectual Property, Revenue, and Trusts and Probate. The change was meant to enable judges who have suitable expertise and experience in the specialist business and property jurisdictions to be cross-deployed to sit in the specialist courts, while continuing existing practices for cases that proceed in them. The Family Division deals with personal human matters such as divorce, children, probate and medical treatment. Its decisions are often of great importance only to the parties, but may concern life and death and are perhaps inevitably regarded as controversial. For example, it permitted a hospital to separate conjoined twins without the parents' consent; and allowed one woman to have her life support machines turned off, while not permitting a husband to give his severely disabled wife a lethal injection with her consent. The Family Division exercises jurisdiction to hear all cases relating to children's welfare, and has an exclusive jurisdiction in wardship cases. Its head is the President of the Family Division, currently Sir Andrew McFarlane. High Court Judges of the Family Division sit at the Royal Courts of Justice, Strand, London, while District Judges of the Family Division sit at First Avenue House, Holborn, London. The Family Division is comparatively modern. The Judicature Acts first combined the Court of Probate, the Court for Divorce and Matrimonial Causes and the High Court of Admiralty into the then Probate, Divorce and Admiralty Division of the High Court, or The Court of Wills, Wives & Wrecks, as it was informally called. That was renamed the Family Division in 1971 when the admiralty and contentious probate business were transferred elsewhere. The Family Division has faced criticism by allowing allegedly abusive partners to cross-examine their former partners; a procedure already banned in criminal procedure. Peter Kyle, MP for Hove, claimed this amounted to "abuse and brutalisation", and called for the system to be changed. Liz Truss, when she was Lord Chancellor, announced plans to end this practice, and proposals were contained in Clause 47 of the Prisons and Courts Bill before Parliament was prorogued for the 2017 General Election. The Justices of Her Majesty's High Court of Justice are informally known as High Court judges, and in judicial matters are formally styled "The Honourable Mr(s) Justice (Forename) Surname", abbreviated in writing to "Surname J". In Court, they are properly addressed as My Lord. Since by convention they are knighted upon appointment, socially they are addressed as Sir Forename or Dame Forename, without the prefix, The Hon., which is given only to their office. High Court Judges are sometimes referred to as red judges after the colour of their formal robes, in contrast to the junior Circuit Judges who are referred to as purple judges for the same reason. Masters (also Judges in the High Court) are addressed as 'Master' regardless of gender and they wear dark blue gowns with pink tabs echoing the red of the High Court Justices' robes. Within the Chancery Division of the High Court, there are also Insolvency and Companies Court Judges, who hear the majority of High Court insolvency (both personal and corporate) and company law cases, together with some appeals from the County Court. They too wear dark blue gowns with pink tabs and are addressed as 'Judge' in court. Justices of the High Court, Insolvency and Companies Court Judges and Masters are appointed by the Queen on the recommendation of Judicial Appointments Commission, from qualified lawyers. The Lord Chancellor, and all government ministers, are statutorily required to "uphold the continued independence of the judiciary", and both Houses of Parliament have Standing Orders to similar effect. High Court Justices may be removed before their statutory retirement age only by a procedure requiring the approval of both Houses of Parliament. In addition to full High Court justices, other qualified persons such as retired judges, Circuit Judges from the county courts, and barristers are appointed to sit as Deputy Judges of the High Court to hear particular cases, and while sitting are addressed as though they were full High Court Judges. Many trials in London are conducted by Masters, who have almost identical trial jurisdiction as full High Court Judges but who do not hear committals to prison, criminal cases, or judicial review and do not travel 'on circuit' to outlying courts. High Court justices (usually from the Queen's Bench Division) also sit in the Crown Court, which try the more significant criminal cases, but High Court Judges only hear the most serious and important cases, with Circuit Judges and Recorders hearing the majority. Historically the ultimate source of all justice in England was the monarch. All judges sit in judgement on the monarch's behalf (hence they have the royal coat of arms displayed behind them) and criminal prosecutions are generally made in the monarch's name. Historically, local magnates administered justice in Manorial Courts and other ways. Inevitably, the justice administered was patchy and appeals were made direct to the King. The King's travelling representatives (whose primary purpose was tax collection) acted on behalf of the king to make the administration of justice more even. The tradition continues of judges travelling around the country in set 'circuits', where they hear cases in the 'district registries' of the High Court. The 'main' High Court (in the City of Westminster, London) is not itself a High Court district registry. The Senior Courts Costs Office, which quantifies legal costs pursuant to orders for costs, serves all divisions. Such Costs Office is part of the High Court. Because the Costs Office is part of the High Court, generally all detailed assessment proceedings commenced in the Costs Office are subject to provisional assessment. Exceptions from provisional assessment are detailed assessment proceedings in which the costs claimed are large (greater than £75,000) or in which the potential paying party does not respond to the notice of assessment. ^ Williams, Smith (2010). p. 6. ^ a b "Constitutional Reform Act 2005 (c. 4)". Opsi.gov.uk. 24 March 2005. Retrieved 13 March 2009. ^ See Challenges to decisions of England and Wales magistrates' courts. ^ See Courts of England and Wales for an explanation of these courts. ^ Laville, Sandra (22 December 2016). "Revealed: how family courts allow abusers to torment their victims". The Guardian. ISSN 0261-3077. Retrieved 19 June 2017. ^ PoliticsHome.com (2017-02-12). "Liz Truss to ban 'humiliating' questioning of women by abusive exes in court". PoliticsHome.com. Retrieved 2017-06-19. ^ "Clause 47 | Prisons and Courts Bill 2016-17". services.parliament.uk. UK Parliament. Retrieved 19 June 2017. Williams, Glanville Llewellyn; Smith, A. T. H. (27 July 2010). Learning the Law. Sweet & Maxwell. ISBN 978-0-414-04173-8. Retrieved 29 August 2011.